SINGAPORE - Capitaland marked a record year of 1 million square metres of retail space offering with the opening of its largest mall yet in Suzhou, China. The Suzhou Center Mall is also the largest shopping centre in the Chinese city and more than three times the size of ION Orchard in Singapore - spanning close to 300,000 square metres (sq m) in gross floor area (GFA) excluding car park. It boasts over 600 retail brands housed within an architectural masterpiece. The mall is located in the heart of the western central business district (CBD) of Suzhou Industrial Park, right next to the historic Jinji Lake and traditional Suzhou city centre. 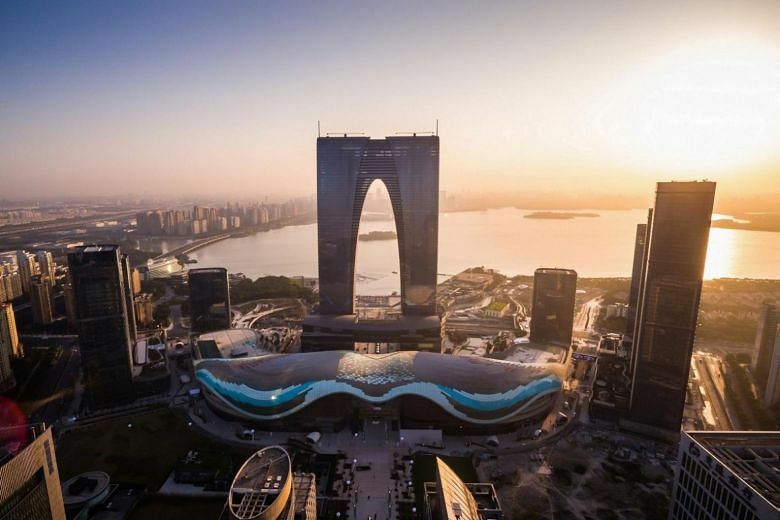 The sprawling Suzhou Center Mall is the centrepiece of the Suzhou Center integrated development that also comprises four Grade A office towers, two luxury residential towers and the W Suzhou hotel tower, which are all interconnected. With a total GFA of 1.13 million sq m served by a newly built 1,570-metre underground tunnel leading to its basement car park and directly linked to two metro lines, Suzhou Center is positioned as the city's new CBD and is master developed by Suzhou Hengtai Holding Group, which is owned by the Suzhou Industrial Park government. CapitaLand, through its wholly owned shopping business CapitaLand Mall Asia, is the co-owner and co-developer for the shopping mall and two 21-storey office towers, which opened for business in the third quarter of this year. CapitaLand CEO Lim Ming Yan said the mall's opening caps a record year for CapitaLand. "Close to one million sq m of retail GFA across eight1 developments turned operational in 2017, marking our largest ever retail GFA offering in a single year," he said. Mr Jason Leow, CEO of CapitaLand Mall Asia, said that as of end-September, about 85 per cent of CapitaLand's total assets contribute to recurring income, of which shopping malls and integrated developments form the bulk. "As we increase CapitaLand's recurring income base with the opening of new malls, we will also continue to enhance our retail scale and network through acquisitions and management contracts, as well as reconstitute our portfolio to achieve an optimal asset mix that provides us with stability and a strong recurring income stream," he added. Designed by multiple award-winning architectural firm Benoy, the seven-storey Suzhou Center Mall has a gently undulating roof that is the world's largest free-form monocoque roof at over 36,000 sq m. Shaped like a pair of phoenix's wings to symbolise Suzhou's growth taking flight, the multi-coloured roof is made up of 6,947 pieces of uniquely-shaped curved glass. Suzhou Center Mall also boasts of 60,000 sq m of greenery across its numerous outdoor terraces, rooftops and the landscaped cantilever bridges that extend from two ends of the mall to the lakefront. A 45-metre-wide and 25-metre-high water curtain lies on the mall's faÃ§ade facing Jinji Lake. The mall opened with more than 90 per cent lease commitment for its net lettable area of approximately 152,000 sq m. Anchor tenants among the mall's over 600 brands include Suzhou's first CGV cinemas, its first Fanpekka children's theme park, first indoor simulated counter strike gaming centre, an Olympic-size ice rink, a gourmet supermarket and foodcourt. CapitaLand said that with the opening of Suzhou Center Mall, 61 out of its total portfolio of 69 owned and managed malls in China are operational. Across Singapore, China, Malaysia, Japan and India, CapitaLand owns and manages 109 malls, of which 95 have opened.